A Glimpse of Kripa Mehta's Grand Indian Wedding in Jodhpur- #TheMehtaWedding! Alia Bhatt’s bestie Kripa Mehta’s big fat Indian wedding is the talk of the town. With elaborate pre wedding functions such as mehendi, sangeet, BBQ dinner, polo brunch, etc this has been one grand affair. We’ve got some exclusive pictures all the way from Jodhpur and they are jaw droppingly beautiful! Have a look as we take you around #TheMehtaWedding! 2. The maroon leghenga coupled with emerald and gold jewellery looks simply ravishing! 3. 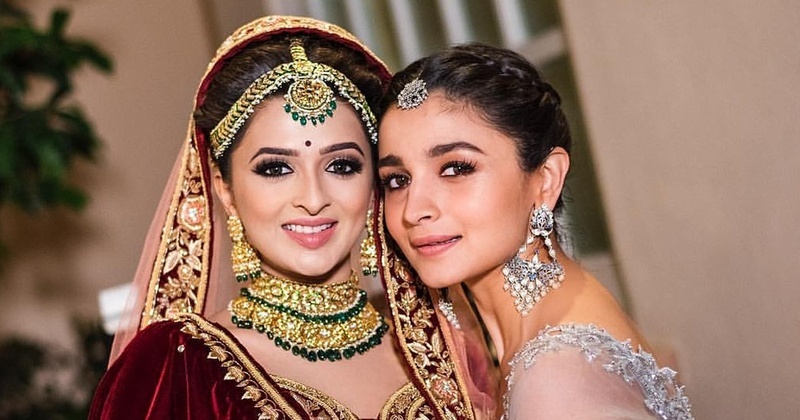 Alia Bhatt being the perfect bridesmaid every bride deserves. 4. The bride squad making sure the bride looks just PERFECT for her D-day! 5. The bride and her BFFs look so beautiful! 6. The groom is all set on an elephant to meet his alluring bride! 8. Bridal entry in a royal palki driven by golden swans! 10. They look so cute together! 13. Happiest cause now she is his forever! 14. Kripa Mehta’s father can barely contain himself on his daughter’s vidaai. Aww! 15. Her favourite partner in crime! 17. Let’s see who emerges the winner in this competition! 18. Sorry Kripa, but Yash seems to have won this one! 19. Bless this happy couple! We wish all the happiness to Mr and Mrs. Mehta!